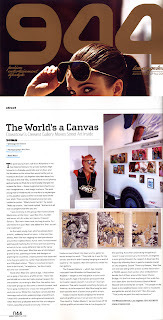 Crewest Gallery News: 944 Magazine says "The World's A Canvas"
944 Magazine says "The World's A Canvas"
Check out this month's issue of 944 Magazine, nice little write up on us. triptych by our homies Syndrome. If you read the article, River City Visionz will be in September not August!